So how wil he beat Team Canada. Jim is going to personally improve, and that will improve the entire team. And does he think Norway will out-skip Armstrong?????? Canada won this year by ice reading and strategy. Per's comment about knowing the simple way to beat anada would have to include kidnapping Jim Armstrong. Sounds like he has thrown a challenge out to Canada, and I can't ee him being successful. So what is Canada's achilles heel? Per sounds pretty sure of himself for a coach that couldn't get his initial team into Paralympics. Didn't I hear a few days ago that Jim Armstrong was offered the coaching position in Norway? So, now it's all about "how to beat Canada"........what a difference a year makes. Team Norway has the history, but I think Team Canada has the future. If selection is so great then why are they always afraid to play the national winner for the top spot? I understand that im Armstrong is in favour of a national winner/Team Canada playoff, but don'tknow how that will sit with the CCA stakeholders. CCA stakelolders will not allow this, and, ironically, it will be Jim's presence that now will give them the record to prove the program works. Face it folks, until then it is a selected team. and I don't care who likes it or not including Jim Armstrong. The powers that be......the money givers like it the way it is. I think Armstrong will press for a playoff post 2010. He doesn't like anything that appears biased. If selection lasts to 2014, it will last until Joe Rae retires. And now, why should he? His "program" just resulted in a World Championship, and likely many more trinkegts in the near future....oh, sorry, PERHAPS the success of the program is the result of Jim Armstrong being able to save their collecive a__es. How can anybody in their right mind make such a foolish statement? When will the CCA admit they lucked out. Armstrong's inclusion in the program has legitimatized hundreds of thousands of dollars spent. Without this oddity, Canada is middle of the pack, regardless of money spent, and their "selection process" would look like hell. I think any national coach worthy of their title will have a plan to defeat any opposing team. Whether they have the athletes to put that plan into motion is another matter. What surprised Per, and surprised me, is how few players we spoke to (and between us we had spoken to a lot) had a specific plan to beat Canada. "We just play our own game," was a typical comment. 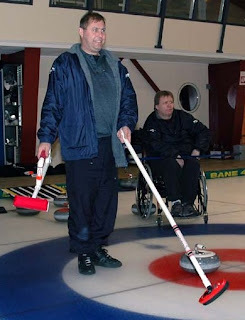 At other levels of international competition, Canadian coaches predominate, but not so far with wheelchair curling. I think it would be fair to say that most national programs do not have the financial resources, or the depth of coaching experience (and with Armstrong, the playing experience) available to Canada. But Canada can be beaten, even with Armstrong, as their 4th best 5-4 round robin record at the 2009 Worlds showed. That record included a final game loss to Norway when Canada's playoff place had not been assured. So I think that anyone who studied Canada's performance at the Worlds could easily see where their weaknesses lie and could draw up a plan to exploit them. But then that plan would have to be executed and with the sport at its current level technically, there's only so much a coach can do to ensure that. How would I have tried to beat Canada at the 2009 Worlds? Put pressure on the front end's hitting game. Then force Armstrong to make his shots by playing into the middle, knowing that if he struggles, so does the team, especially Neighbour. Will that plan work next year? I don't know. But I do know from observation that Canada likes to keep the front open for skips stones, so that's where my 2010 plan would start. And I am sure that with his experience Per has just as viable a plan for Norway. I think your strategy is right as far as you go. If you allow Armstrong to dictate the type of game, you will lose, pure and simple. However, Jim will dictate and control the game unless you take significant chances, forcing the game to a bump and grind in the four foot. The problem is that if you continue to ignore the outside to force the game to the middle, he will eventually make you pay by counting the points in the twelve foot. That is Canada's big advantage.......there will be NO strategy mistakes in a game that can be won by strategical advantage. The other point is that Jim was on his own self-professed "learning curve" of his first real international competition at the Worlds 2009. He will be much better, and, obviously so will the rest of the team. His strategy is second to none, and this, linked with improved shooting, wil makd Team Canada VERY difficult to beat. Our rookie skip, in his first real competition, hits gold, and by his own admission, was on a learning curve. No team, with whatever coaching will be better equipped....and his game will improve????? And this will raise the game of the rest of the team????? Okay, good for Per for figuring out how Norway can beat a fourth ranked team in the world....why all the interest, if Canada "lucked out" at the Worlds, and they are actually, as the record pre-2009 shows is they are a non-medal team? My take....Canada at least even money to win in 2010. Good luck, Per.....Want to make a bet against Team Canada? I don't think I would be so quick to say I have the way to beat Canada. I believe, that with a full season of play, Jim will virtually be unbeatable. Ridiculous to say they can beat Canada. Jim and the team will be MUCH stronger next season, and they HAVE ALREADY WON THE WORLDS!!! Interesting concept, Eric, on how to beat Canada. But one of the earlier comments exposed the flaw......you will have to gamble the farm to force Armstrong out of his game plan, and ONE mistake, he will stick the knife in and break it off. I watched Jim for years in the able-bodied game literally lead the opposing skip by his nose and force him into the Armstrong game plan, and in Wheelie curling, he brings such a large advantage to the game. I think the point here is not that Canada will be beaten: it is to say that having a plan is necessary, and certainly better than having no plan at all. But I think any game plan which will POTENTIALLY take Jim away from his plan will involve significant risk. I also believe that as Jim and his crew get more game time together, they will be technically more sound than last season, which will start the cycle again, of allowing Jim to play his own game AND having the shotmaking to back it up. A daunting task for any country to attack, since, I believe that our strategic advantage is lightyears ahead of the rest of the world. The "new" Team Canada is so far above any team we have had to date. Technically sound, and improving; startegically alone at the top; AND no apparent philosophical or team issues. Seems like the "dream team" for our sport. Brings it back to giving Chris Daw another shot....they could be stronger with another hitter....and it seems Chris could button the mouth under Jim's direction. I still think Daw could be a potential asset. I can see Sonja on he starting lineup sill an issue, despite her performance at the Worlds. Common sense suggests they should have a better hitter to coordinate with Jim's game plans. Balance is what Sonja brngs to the on-ice team dynamic. As Armstrong goes, so will Team Canada, and I suspect jim will reset the standards for the sport. Norway will not be close. Jim is good, in fact better than good. And no question, he has knowledge of trategy, ice-reading, team amanagement that able-bodied teams dream of. BUT, he cannot win alone. Joe and Jim HAVE to improve the play of the rest of the team to take advantage of what he brings to the party. It would also help if the team cna mature enough to understand a more sophisticated game, rather than merey accept Jim's word. That said, I imagine EVEY team in the world would like to have these as the main isues. You are a very lucky coach, Joe Rea. Don't you find it interesting that for the first time EVER, Canada is the team to beat. I certainly don't wnat to minimize the 2006 win, but, by everyone's admission, it was an upset, in the semi's and again in the finals. I know that JIm "missed" his last shot in Scotland, only to result in a tie with the other Team Canada, assuming a two team Canadian tie is great, and then the locals request a toss-off for a winner, with which Jim simply won it since they Team Canada 1 and 2) couldn't go home tied. Canada CAN be beaten, but I think the law of averages say they will win more than their share of close games, simply because there will be no strategic mistakes. It showed at the Worlds, that a so - so week technically still turned into a major win. Canada is on heir own level for strategy and ice-reading. Team Canada will be a marked team this coming season. It will be interesting to see how the team handles the added presure, since other than Jim, this will be a new experience. Even Jim has not experienced the favourite role in this format.....tough for the entire team, and team dynamic will have to show. It appears that Team Canada has finally found team harmony (rather in the good old days). It will do them well as they embark on such a big season. It will be a very interesting season. Jim will no doubt continue to improve, and the rest of the team, I suspect will improve with him. Are they doing much over the summer? Team Canada have 3 training camps scheduled before leaving for Norway and Scotland the second week in October. Doesn't seem to be a particularly agressive off-season, when you look at the size of the year. Complacent???? Thanks all for your comments. First I will say that I have great respect for Team Canada, Jim Armstrong and for Coach Joe Rea, who I all call my friends. I have no intention what so ever to put down Team Canada. On the contrary, my comment was made out of respect for the Canadian team, who have improved their game very much from the Worlds in Sursee 2008 to Vancouver 2009. As Coach you have to find weakness in the opposing team. You are right in the fact that Jim is brilliant in tactics and in reading the ice, no doubt about that. But a team is no better than the weakest link. That is why you have to find precisely that in the opposing team. Which player does not perform his or her best, put pressure on the opposing team and other things which destroy the opposing teams play. As Coach I see the Canadian team as the most likely winners of the Paralympic Gold Medal, so you have to have a plan if you want to beat Team Canada. That is quite simply, a great explanation. And you are right in picking Canada as the team to beat in 2010. And, given that fact, then everyone's focus has to be to analyze them, and in particular, Jim, to determine the opportune way to attack them, since there will be 9 other teams wanting to hit the podium. I still see Norway as the team to beat, what with their experience, and success since the last Paralympics.....most successful team on the planet. I agree that Jim Armstrong is the big difference in Team Canada since 2008, but as has been discussed here, the biggest advantages he brings still requires some help from the rest of the team to utilize fully. Jim and Team Canada are definitely the new benchmark to beat. I believe, as well, that the team to beat will be Norway....by far and away, the most success in the last few tears, and Team Canada could simply be an anomaly for last year. I agree that Team Canada now has to be the team to beat. It is tough to beat great strategy and ice reading. Certainly would be a more balanced field without Armstrong. You are correct. Without Jim, you could through a blanket over the top four teams, with Norway and Germany probably witht he advantae. So, I am sure Canadian curlers want to be perceived as he best, and as they should be.....and seems everyone has accepted Jim's eligibility, as it should be (only one assessor in the history of the sport), so does Jims playing orque an otherwise very level playing field, or does his participation improve the profile of the sport? Personally, I think that we need him to carry the message, as we go through our biggest media opportunity this coming season. And all thanks to Joe Rea....he fought for Jim's eligibility. Now we are back to an original issue....should Jim be allowed to play? Sorry, don't think so....Jim needs surgery before he can play next season, and no date set. Heard this from a reliable source. Doesn't that but a new spin on things? Where is Chris???? ?